Consortium of AKUT Partner & Dipl. Ing. Gregor Heckenkamp (Luckau). Optimization of local heating, network variations, reduction of net head losses. Tendering process for district heating station. Planning of wood chip heat generator. Building Services Engineering: boiler house and heating network, integration of heat storage tank, assistance at commissioning and approval. 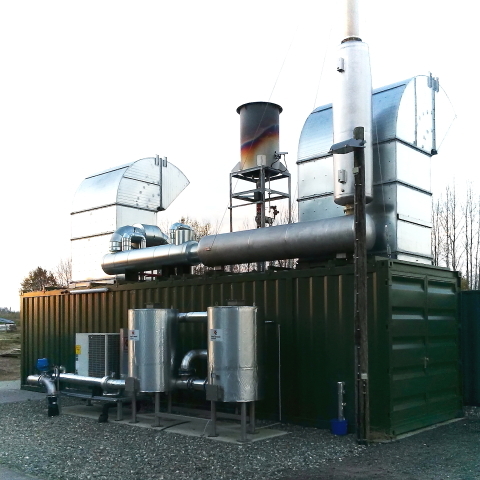 Base load provision CHP (Biogas): 600 kWtherm. Peak load coverage (wood chips): 800 kWtherm. Heat usage during summer period: 600 kWtherm with drying plant and heating of outdoor swimming pool. Total costs of 1,8 Mio EUR. 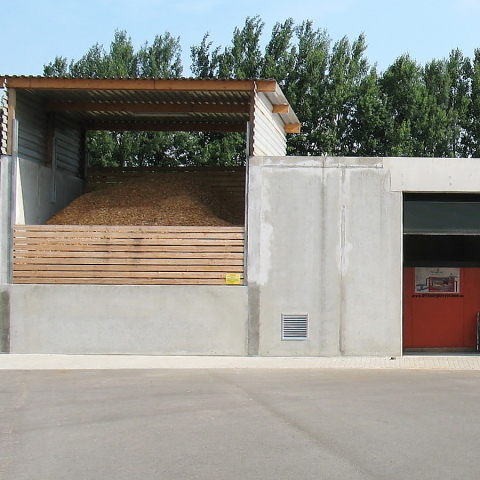 A local heating network for parts of the city of Hitzacker (Elbe, Germany) had to be planned and designed to ensure a maximized thermal energy recovery of the CHP of the Biogas plant Hitzacker. 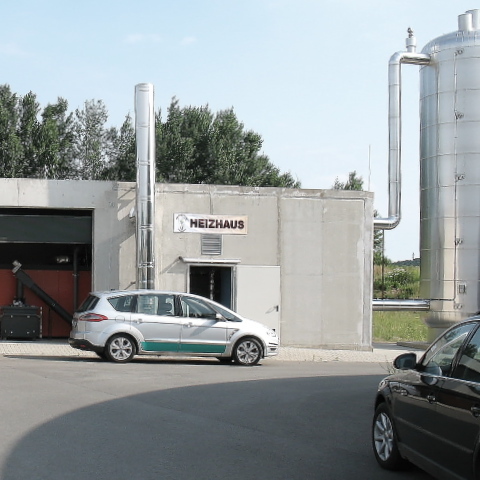 Positive economic effects was an important premise of the owner, the “Naturenergie Hitzacker UG & Co. KG”. In order to achieve a high degree of utilization special attention has been put on the year round heat usage and the minimization of operating hours of the medium and peak load boilers. Altogether 55 transmission stations for plots and building connections had to be considered, ranging from small demands below 15 kW up to 400 kW heat. Two schools, an outdoor swimming pool and a business establishment had to be connected to the network. This requirements profile resulted into the claim for a contractually guaranteed heat supply service. Therefore an adapted remote control and monitoring system had to be drafted as well. The network planning had to consider road and railroad track crossings. Some already existing heating stations had to be reengineered for the heating network without major expenses. The new system had to comply with requirements of VDI 2035 to avoid corrosive damage of system components. First of all the connection density of the heating network of 5 km was optimized. This created a sufficient base load demand for the heat generated in the combined heat and power unit (CHP). Unavoidable heat losses forming in the distribution network itself have been countered through a maximized lowering of the inflow temperatures (amongst other measures through frequency controlled heating pumps) during start-up phases of operation. The total heat usage was extended over the summer period through installation and connection of the drying plant, the swimming pool and the business establishment. 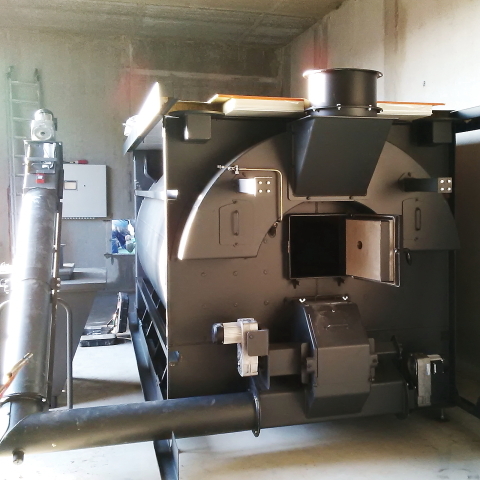 Further requirements on heat supply (medium and peak load, security of supply) are assured by an automatically operated wood chip boiler with a power range from 450 to 800 kWheat . 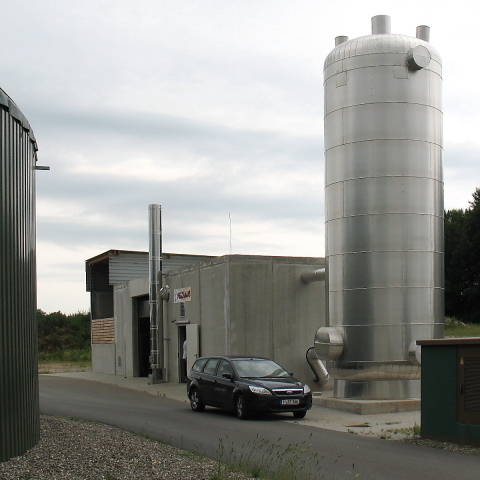 The inclusion of a 55 m³ heat storage tank tops off the optimization. This way it is possible to supply peak demands (e.g. morning time in transition stages) without or with only minimal operation of the solids boiler. The treated network water is held in optimized quality through an automatic degassing unit and an automatic dosing station. Within the first year of operation the total heat transfer to connectees yielded 2,5 Million kWh from renewable energy sources (not even including the industrial drying station).